No harm in being a little "messy" this weekend, right?! Ginnie Hart: Thanks, Frances. You know how it is...gotta start them young. "When I grow up, bands are going to play for me"
Ginnie Hart: Exactly, Ray. The way he hung around here, I 'spect his mommy or daddy played in the band. Wonderful shot - love the selective coloring! I'll be in Phoenix with Diana - always the possibility of things getting a little "messy"! Ginnie Hart: Thanks, Elizabeth. Everything doesn't have to be perfect for a great weekend! Enjoy it. Trust you to spot him, Ginnie! Ginnie Hart: HA! By the way he was hanging around, I 'spect his mommy or daddy was in the band. Great shot, I wonder if his daddy was playing in the band. 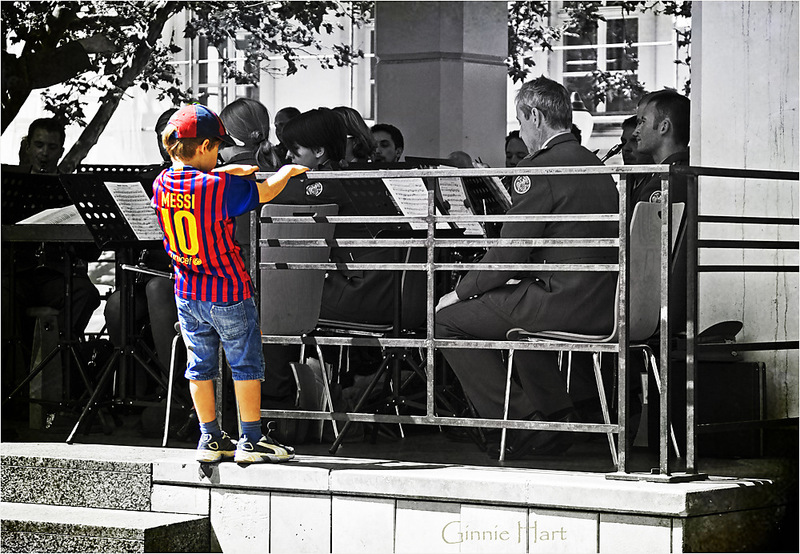 Ginnie Hart: Gotta start them young, I say, whether for sports or for music! For how he hung aroubd the bandstand, I have a feeling someone he knew was definitely in the band. They looked useed to him. Ginnie Hart: Thanks, Peter. Couldn't resist this one. a fine selective colouring - and a nice observation! The boy may be sorry that Messi didn't become footballer of the year! Ginnie Hart: Bedankt, Philine. But at least he's in a great TV commercial that I often see on CNN Int'l. Nicely taken Ginnie. I wonder why Luxembourg has an army? Ginnie Hart: Thanks, Chris, and good question! Perhaps he's deciding whether he wants to be an overpaid footballer or an underpaid musician. Ginnie Hart: Exactly, Sheila. I have a feeling his mommy or daddy was on that stage playing. Ginnie Hart: HA! Good one, JC. A rather nice image and the selective colour (something I'm generally not keen on ) works really well. Ginnie Hart: Thank you, Richard. I know it's not everyone's cuppa tea but sometimes I just can't resist. What a perfect pose,another cracker Ginnie. Ginnie Hart: Most kind of you, Martin. Thank you. Ginnie Hart: Thank you, Helys. It's fun, isn't it. Every boy wants to be Messi, hopefully they will soon want to be Ozil Ginnie. When he grows up he will photograph bands. Ginnie Hart: HA! Good one, Mick. Ginnie Hart: Most kind of you, Martin. Thanks. Excellent work Ginnie, bravo ! Ginnie Hart: Many thanks, Marie! Lovely shot, Ginnie. The colouring is great. Ginnie Hart: Thanks, Pauline. Not everyone likes "colouring" but I still am quite the kid at heart. One day I will be Messi, but his mother reckoned he is already a bit messy. Please don't restrict my messiness to the weekend only. Ginnie Hart: For you, Louis, you can be Messi any time you want! Kid's curiosity is one of the best things in the world to watch and connect with. Well done. Ginnie Hart: So true, Mary. So true! Thanks. I'm enjoying the comments as much as the photo. Ginnie Hart: Awww. Thanks, Ruth. It's fun, isn't it. Cute and such a "Ginnie" capture! Ginnie Hart: It was fun to see, Robin. Thanks. Excellent with the selective colouring. Well spotted Ginnie! Missy, don't ya mess with Lil Messi! He was trying to conduct. >And did I see a harp? Yes (you must have remembered I was just in Dublin!). I can't wait to see your holiday photos. Did their Irish lilt make you feel homesick? Ginnie Hart: How could I have forgotten you, too, were just in Dublin! Duh. I LOVED their lilt, as you say. Not too American to me but maybe from the British English side, yes? Anyway, it was a great time! Thanks. Ginnie Hart: Thanks, Janet. He definitely was the star for me. Ginnie Hart: If his mommy or daddy is in the band, Alan, the chances are good that he, too, will read music eventually, if not already. In the meantime, enjoy your messy weekend. Ginnie Hart: Thanks, Linda. He was hanging out the entire time we were there, which is why I 'spect his mommy or daddy played in the band. Such fun - what you do - with your selective coloring. This one pops!!! Ginnie Hart: You could say I'm a glutton for selective coloring, Marcie, whenever I can get away with it. Thanks. What a great shot, Ginnie! I love it! Ginnie Hart: Thank you, Jennie. It's fun, isn't it! Ginnie Hart: Either that or he's staying near his mommy or daddy? Ginnie Hart: HA! Gotta love it, Dennis. Ginnie Hart: Sometimes, Larry, YES! Loving it Ginnie, it says so much. Ginnie Hart: Thank you, Sally! Ginnie Hart: Thanks, Joshi, and, yes. He was all over the place. Great play on words, Ginnie, and wonderful job on the selective colouring. This tyke obviously has an ear for military music. Another Sousa in the making? Ginnie Hart: Thanks, Beverly. Definitely a little Sousa in the making...after his Messi years are done?! thinks....I'd rather be listening to "One Direction"
Wonderful shot! And a good effect with this selective colouring - like it! Ginnie Hart: Let's hope he has a long life in front of him, Emma. i'm not a big soccer fan, but i can't help but appreciate the talent that guy has.. nice candid shot too btw..
Ginnie Hart: I guess a lot of little kids know how good he is, Rian! Thanks. Ginnie Hart: Big oaks from little acorns grow, JP.